I was at a local user group recently where the topic of the meeting was one of the hot new cross-platform mobile development options out there (doesn’t really matter which one). There was the usual UIkit bashing, which was expected since the topic was to propose an alternative programming model. 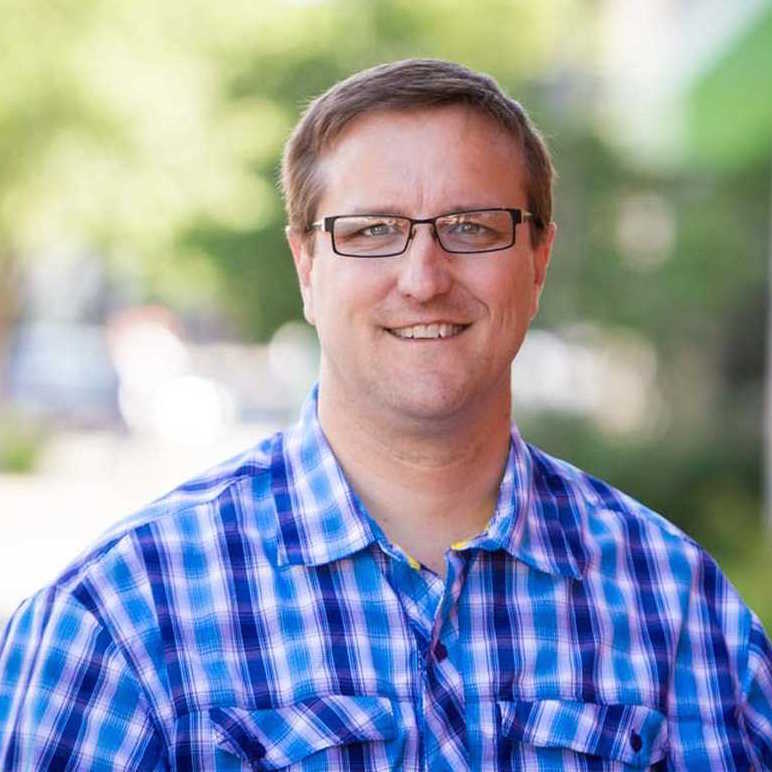 I’m not here to defend UIkit, because I agree that it can use some improvement. However, the speaker did say one thing about Auto Layout that I have heard before and that rubbed me the wrong way. I’ve heard people say things like, “You need a mathematics PhD to understand Auto Layout,” or, “You need to be a rocket scientist to understand Auto Layout.” I’m not going to get into a debate on how hard rocket science actually is—you can see reddit for the answer. Instead, in this blog post, I will show you how easy the calculation for Auto Layout is. In fact, the linear equation is so simple that an elementary child could do the math. So why do people think Auto Layout is hard? Well, I don’t think Xcode’s interface builder helps the situation. 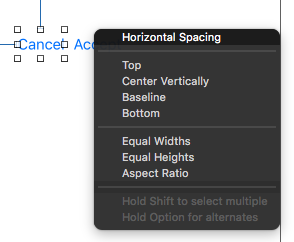 Xcode has improved since Auto Layout was introduced, but it can still be hard to see how the Auto Layout equation relates to what you see in interface builder. Let’s see if I can demystify Auto Layout a little. The Auto Layout equation combines these two into one to express any kind of relational constraint. To express the width of the Accept button, we don’t need the constant, so that becomes zero. I think this is where some of the confusion starts with Auto Layout because Xcode’s interface builder doesn’t always show the equation in the order you are expecting. It is not logical to think of the distance between the two buttons as a negative number. If you want to know more about the equation, Apple has a great page explaining the Anatomy of a Constraint. Next, I’ll show you how interface builder uses this equation to build a constraint. Let’s create the same horizontal constraint between our two buttons. 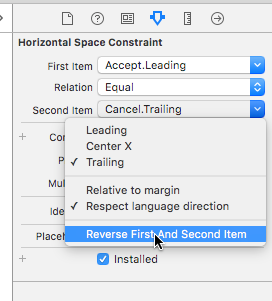 I am not going to go through all the different ways you can create a constraint in interface builder because there are several different ways. My favorite way is to press the control key and drag a constraint from the first item to the second. After I drag UI elements into my view controller, I give them a meaningful name in the document tree. This is very helpful in understanding which control is which when looking at the attributes of a constraint. 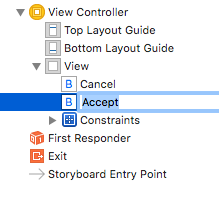 Xcode will use the the name of the control in the attribute inspector so it is easier to identify your controls. 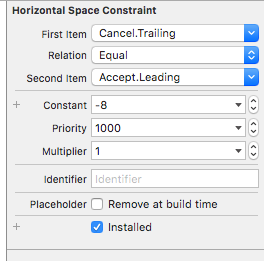 Now let’s look at the attributes of the horizontal constraint and try to find the elements of the equation in interface builder. 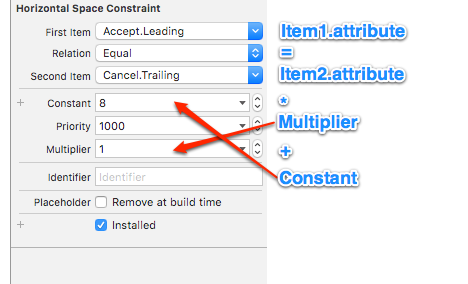 When you add constraints in Xcode, the order of the equation may not be what you are expecting so the numbers will be reversed. Here you can see that my constant is a negative number and the first and second items are reversed. I believe this trips people up in understanding what is going on. You can fix this situation by reversing the first and second item. I often do this so that it is clear in my head (even though, from a mathematical standpoint, it is the same). After you reverse it, the negative constant becomes positive again, and the items appear in the order you expect. Hopefully, this is helpful to someone new to Auto Layout. We don’t need to hire mathematicians to lay out our controls. The math is pretty easy, although Xcode doesn’t help the situation sometimes.